Uc Mihrapli Mosque: Situated on the Unkapani Road, in a place called Kucukpazar, Uc Mihrapli Mosque with the features it possesses is a quite interesting mosque. 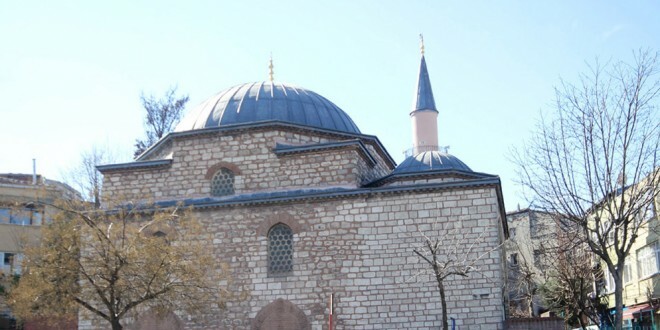 The benefactor of the mosque is Hoca Hayrettin Efendi who tutored Fatih Sultan Mehmet in time. Uc Mihrapli Mosque which was built in 1469 had been extended for Fatih Sultan Mehmet for the insertion of a minbar and a second mihrab had also been added at that time Later, whenthe daughterin -law of Hoca Hayrettin Efendi decided to extend the mosque by adding her own house to the mosque, a third mihrab had been added. Attaining a unique construction style in this sense, the mosque formerly known as Hoca Hayrettin Mosque or Kazancilar Mosque has come to known as Uc Mihrapli Mosque, taking its name from its three mihrabs. The two additional mihrabs of the mosque had been wrecked in time; however during the reign of Abdulhamit II, thet were restored possibly true to their originals. Its minaret collapsed in 1956 due to an earthquake but a new minaret was built in a short time. The two porticoes which were demolished between the years 1959-1960 had been repaired to keep this matchless construction alive. The mosque is built completely out of rubble stone and the mihrab has a sharp pointed architecture. Some works in Ottomans got their names from their distinctive features. Such as “the mosque with Three Minaret Balcony” (Uc Serefeli Camii) Uc Mihrapli Mosque has also got its name this way. The only similar mosque is the Uc Mihrapli Bedrettin Mosque, which was built in Sishane during the reign of Beyazit II.